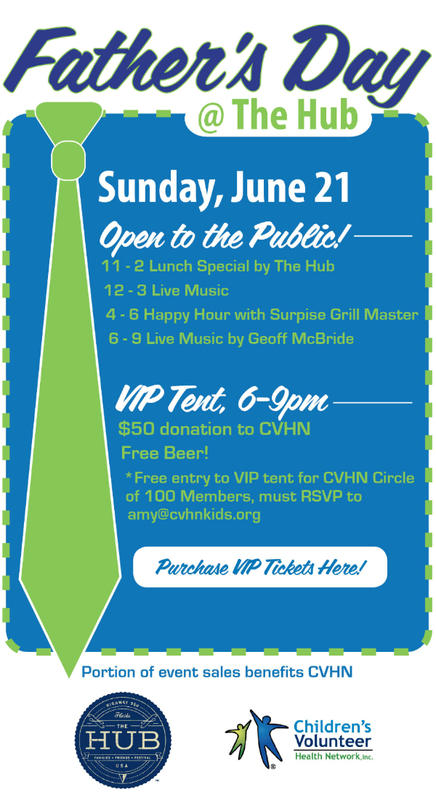 Fathers Day Event at The Hub Benefiting CVHN... music, food, beer! Discussion in 'Events and Activities' started by Teresa, Jun 12, 2015. The Hub and Children's Volunteer Health Network are teaming up to celebrate all Dads! Make plans to bring Dad and the whole family out for a day and evening filled with good food and live music. Join the party at the VIP Beer Tent with all you can drink beer for $50 donation! 20% of The Hub's proceeds will go to CVHN!!! The Hub is a gathering place for family and friends on Scenic 30A in Seagrove Beach with great restaurants, shopping and outdoor entertainment. Restaurants are Mile Marker 15 - Tacos & Tequila, Crave Roadside Burgers, Red's Fried Chicken and Mr. Freeze. Open daily 11am-9pm.The Hub Shop is open daily from 10am-8pm. Watch SoWal.com music guide for free concerts on The Hub stage. The Hub is located on the south side of Scenic 30A near Prominence and WaterSound Beach in Seagrove Beach. Children’s Volunteer Health Network (CVHN) facilitates the delivery of comprehensive, direct medical, dental and mental health services to school children whose family income falls below certain measures throughout Walton and Okaloosa Counties and surrounding communities. Celebrating 10 years serving children in our community!